The Predator is getting ready to blast into theaters next month and a fresh look at the classic hunter has been released to remind everybody of the franchise's 1987 roots. As far as action-thrillers go, it's hard to beat 1987's Predator, which director Shane Black is completely aware of, and not because he played the part of Hawkins in that film. The franchise is from another time, which Black is trying to capture and bring to a new generation. The director jokes that he decided to make the movie as a way to stave off a midlife crisis, but there's obviously a lot more to it than that. "The whole point of it was the nostalgia of, at first, just wanting to go back to a time which was particularly magical. was 20-something years old, I had Lethal Weapon going on, and The Monster Squad, and then the Predator, and it was just such a great period of being green and anxious and wide-eyed and not having really done any of it before. Now, here, I'm in my 50s now and I felt like a mid-life crisis coming on, so I called my friend Fred Dekker, who wrote The Monster Squad, and I said, Do you wanna maybe be like a kid again?" "Predator number one was a piece of pure pulp, right? It incorporated the Rambo phase and the science fiction, aliens craze of the 80s and a wink and nod to the ideas that these are larger-than-life characters with big muscles and impossible guns. It was just the most purely, pop-art shape you could conceive of in the best... the 80s knew how to do that. I thought it would be so much fun in this CG-infested world, to go back and try to make a shape that's pure like that. That's sort of a love letter, as best we can, to the original, and we agreed that would be a fun thing to do." 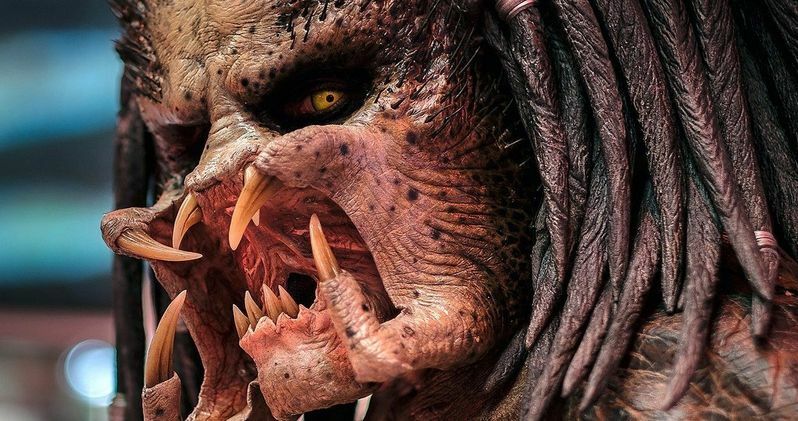 Shane Black's attempts at making a "love letter" to the original Predator movie have many excited to see what the director was able to come up with. But, The Predator already has the cards stacked against it, standing in the shadow of the original 1987 movie. With that being said, many fans would be extremely happy to just get the second-best film in the Predator franchise. You can see the brand-new image of the classic hunter from Shane Black's The Predator below, thanks to Entertainment Weekly.